We tend to think of mass shootings as a relatively recent phenomenon, but one actually occurred in Marion in the 1930s, and it stands out as one of Marion’s more extreme episodes of violence. The May 21st, 1934, headline of The Marion Star. 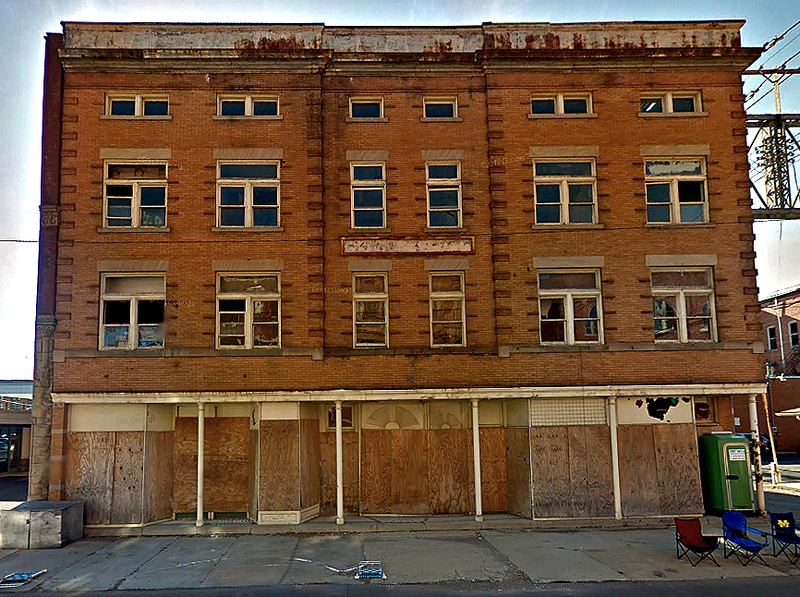 On Saturday, May 19th, 1934, a 41-year-old laborer and WWI veteran named Bert Dean went to the Georgian Apartments on South State Street looking for his estranged wife, Maud. Although Maud didn’t live there, a friend of theirs, a widower named Thomas Hoffman, did. Thomas had just come back from a drive out to Prospect with Maud and another woman named Adeline Pfeiffer, and they were preparing to eat together. 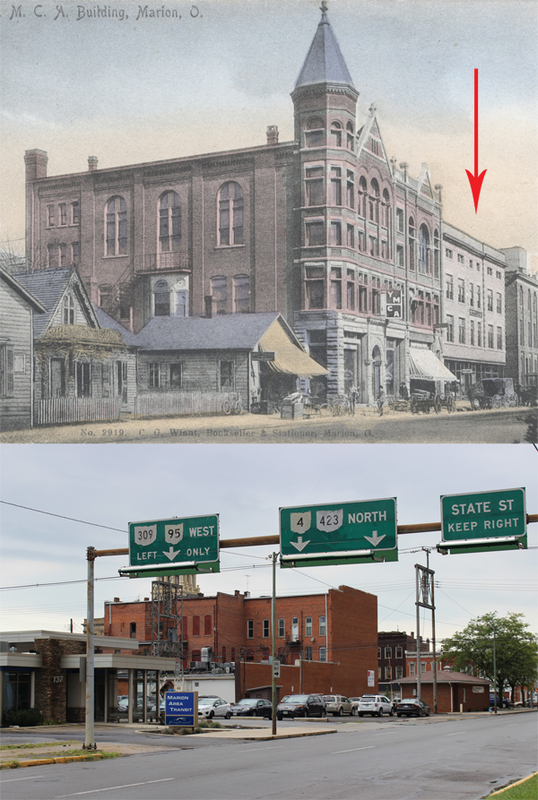 The top image, which is from Mike Crane’s outstanding collection of old Marion photos and postcards, shows the location of the Georgian Apartments building in the early 1900s. The bottom photo, taken in the summer of 2017, shows what this area of South State Street looks like today. Bert Dean, who had been drinking heavily that day, was apparently waiting for them because he knocked on Thomas’ door a short time after their return. Thomas probably wasn’t particularly surprised to see Bert. He knew both Bert and Maud well and was familiar with their marital problems. Thomas invited Bert inside, and at first things seemed cordial. Thomas and Bert talked in the living room while Maud prepared sandwiches. The trio even invited Bert to stay and eat with them. However, the mood of the gathering soured when Bert turned to Adeline midway through the meal and asked, “What do you think of a woman that will leave her husband?” In the ensuing argument, Bert pulled out a .32 revolver, and as the other three ran from the kitchen, Bert began firing. Bert’s first victim was Maud, who took one round to the hip. His second victim was Thomas, with one bullet striking him in the abdomen and another grazing his scalp. Bert shot Adeline in both arms just above the elbows. Despite their wounds, the three managed to escape the apartment. Maud found shelter in a neighboring apartment while Adeline and Thomas fled down the outside stairs at the rear of the building. When the shooting began, another resident of the building named Irene Thomas was standing at the bottom of the back stairs with groceries while her husband parked their car. As she waited, Thomas and Adeline came barreling down the stairs with Adeline screaming, “There’s a crazy man up there shooting everybody!” Just then, Bert appeared and began firing again. One of the rounds struck Irene in the spine and bladder and another struck Thomas in the leg. The Georgian Apartments were located at 131½ South State Street. This photo was taken in 2013. The building was demolished in 2016. The law protects home-wreckers, so I am taking this in my own hands to see that justice is done. While I was in the…CCC camp making a home for my wife, a snake in the form of a friend known as Tom Hoffman wrecked my home so I am homeless and [have] no place to go. Although Maud had worked for Thomas Hoffman as a house cleaner since the previous winter, it seems unlikely that they were having an affair. Maud told The Marion Star that, “[Thomas Hoffman] was just like a father to me.” She had known him since she was a teenager. They’d both worked at the Houghton Sulky Company where Thomas had been Maud’s foreman. After Bert returned to Marion that spring to find Maud no longer willing to live with him, Thomas even allowed Bert to stay with him. However, Thomas also kicked Bert out after a few weeks because of Bert’s excessive drinking. Tragically, it was Maud who had given her husband the gun. A few days prior to the shooting, he came to her saying he was going to leave town soon and would like some of his belongings. Maude met Bert on May 17th, and one of the items she turned over to him was the revolver. Of the four people Bert Dean shot, two of them eventually died from their injuries. On May 22nd, Thomas Hoffman died, and on May 29th, Irene Thomas died. Although Adeline Pfeiffer suffered nerve damage in both arms, she eventually recovered. Maud appeared to come through the ordeal in the best shape (at least physically) and came home form the hospital on May 26th, exactly a week after the shooting. Whether she stayed in Marion and what became of her are, at the time of this writing, unknown. ¹ The facts of the story, as presented in the Star, are sometimes inconsistent. When exactly the shootings took place on the 19th is unclear. In the May 21st edition of the Star, the shooting is described as taking place at around 10:00 p.m. But later the same article states that the shooting took place just after lunch. Maud is sometimes written as Maude. (Her name was listed as Maud in the 1934 Marion City Directory.) The May 21st Star article states that Maud lived on East Church Street while the May 29th Star article erroneously states that she lived at the Georgian Apartments. ² The Civilian Conservation Corps (CCC) was a Depression-era relief program that operated from 1933 to 1942 and offered men employment on environmental projects.